Polenta is one of my pantry staples. If it’s not a staple in your kitchen, let me persuade you: it’s super easy to make when you buy the quick-cooking variety and it’s kid-friendly too. I swear! It has a flavor that’s pretty hard to object to and the fact that you can add cheese to it makes it a guaranteed crowd-pleaser. And there are so many ways to use it: serve it creamy in a bowl topped with veggies, layer it in a casserole with a sauce and cheese, let it set and cut it into slabs, or slice it into fries and bake them until they’re golden brown and crispy. Yes! Fries! 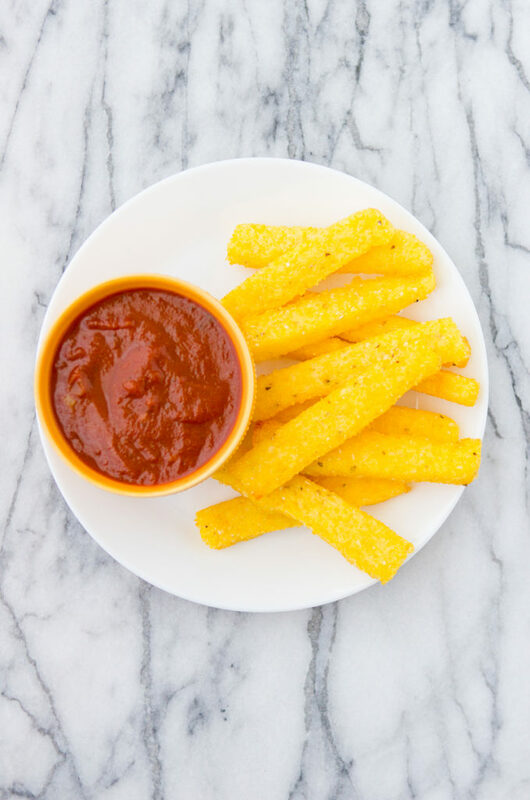 Let’s talk about fries. This requires a little advanced prep, but you can take advantage of polenta’s versatility and make double the amount of polenta for dinner one night; pour half of it into a baking dish to set for later and eat the other half in bowls as a creamy porridge that night. The next day, you’ll cut the polenta into fries and bake them.